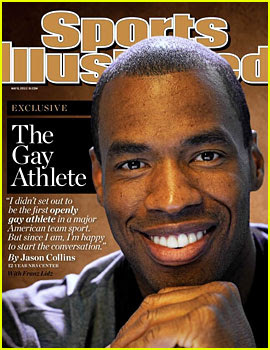 History was made yesterday as 12 year NBA vetran Jason Collins publicly came out. It is a bit unbelievable to think that this is the first time in any of the four major professional sports that an athlete has officially announced they are gay. Bravo Jason! His is truly the face of bravery. I compare this historic moment to the first day Jackie Robinson was signed to the Brooklyn Dodgers in 1947. Collins says he is happy to start the conversation. There are definitely many other gay men playing in these four major leagues and I think this will create a safe path for them to also come out. Collins says in this article, "I'm ready to raise my hand but, you know, you still look around like, 'OK, come on, guys.' It's time for someone else in the room to raise their hand and say, 'You know what? Yeah, so big deal. I can still play basketball. I can still help the team win, and that's what's most important". The outpouring of love and support for Collins has been fantastic. Kobe Bryant tweeted, "Don't suffocate who u r because of the ignorance of others" and Steve Nash said, "The time has come, maximum respect". Even the White House and Former President Bill Clinton were quick to lend support. I wish for a day when everyone could be comfortable to completely be themselves and openly be who they are. I look forward to a time when my son is surprised this was even a big deal, just as we now welcome people of any background and ethnicity to play professional sports. Bravo Jason Collins. Your bravery gives me goosebumps and hope.